Jerry Sabatini on the right holds his painting of Troy which he presented to the community at a ceremony at First Bank of Troy. At left is Robert Nearing, assistant vice-president of the bank. The Troy artist is a deaf and his work was interpreted by Seymour Barrett. In a ceremony before the board of directors of First Bank of Troy, Jerry Sabatini presented his own unique depicition of the Troy community to the community. The self-taught local artist chose to present the painting through the bank. After it is framed, it will probably hang in the Troy Free Public Library. The young artist, son of Mr. and Mrs. Joseph Sabatini of Troy, could not speak for himself as he is a deaf and using sign language, as are two other children in the family. Barrett, a former borough council president and head of the Troy Ben Franklin store and who had once employed Sabatini’s sister, was able to interpret Jerry’s interpretation of the Troy scene. The large painting, made by finger and brush work, is a Trojan rug, the mostly dark colors and blended strokes giving a real feeling of an oriental carpet. The series of borders represent peace on earth with rows of hearts and Bibles to carry out the theme. 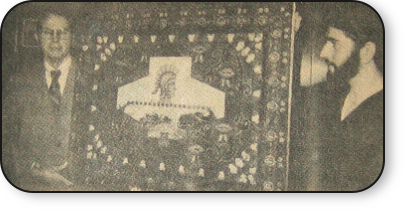 In the center is the head of a Trojan warrior, long the emblem of Troy teams. Directly below is a realistic vignette of Troy painted from the Van Dyne Civic Building. It shows the mounted bell in the foreground which formerly rang out the fire calls in the old firehouse. Then there is a view looking west up Main Street showing the Troy Hotel, First Bank building and the business block that houses the Ben Franklin store on the right, the Citizens bank building, Cooke’s drugstore and McClelland’s on the left. The bridge across the top of the local scene is the one we all cross durning our lifetime. Each of eight footballs ringed around that center panel carries a legend of a vital part of borough life such as churches, schools, hospital, fire company, business, annual fair, etc. It took Sabatini about two and a half months to create. Barrett will have the painting framed, will also add a bronze plaque carrying the artist’s name and date of presentation to the Troy community. Art Education: Born to be an artist, since 5-6 Yrs old. Features original works of art including drawing, painting, sculpting, chairs and many other different kind of art work. Arnot Art Galleries and Museums. Copyrights: Sunset Gallery – Art and Custom Framing.